After last year, when we finished our picnic in the rain and almost dark, we decided to meet this year earlier at 5.00pm. 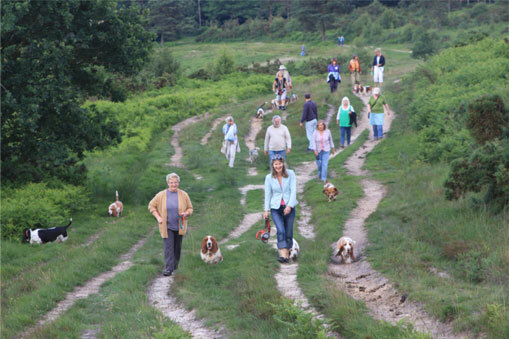 It was a lovely evening, very warm and sunny and we were pleased to see a total of twenty two Bassets, two puppies and a Retriever - plus their owners. The puppies, of course, had their own mini-walk, whilst everyone else set out over this particularly beautiful part of Ashdown Forest. It was so dry that when the hounds were running along they caused great clouds of dust to appear. In fact, when we had finished my shoes were absolutely covered in dust. A little way along our path there was a steep incline with a big pool at the bottom. Of course, quite a few Bassets, together with the retriever, rushed down for a welcome bath. 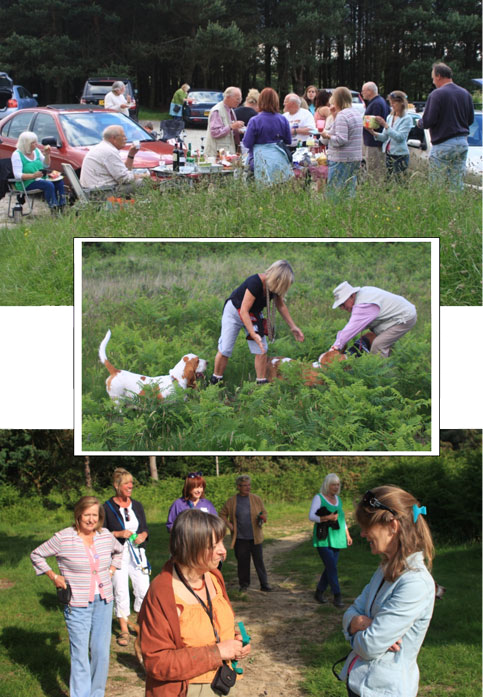 When we arrived back at the car park everyone donated sweet and savoury dishes, plus assorted beverages to a communal picnic. I think that all enjoyed themselves - and were in no hurry to hurry-off home! It was almost dark when we all left.